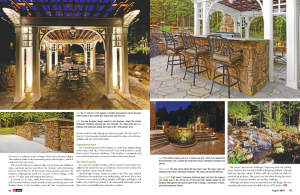 In this month’s Hardscapes issue of Landscape Contractor magazine one of ClaroLux’s Dealers, Southern Exposure, was featured in an article by Michelle Medaris, LC/DBM. The article displays Southern Exposure’s beautifully crafted hardscape project in Summerfield, NC that creates a soothing, calm space, where the homeowner can retreat. Throughout the project includes a total of more than 70 ClaroLux fixtures, such as ClaroLux’s CL-BL23-III brass LED bullet lights, CL-DL4-III brass LED cap lights, CL-GL1 LED grill light, and CL-WL3 LED in-ground LED up lights all of which are linked to an automated, dimmable smart home system that can be controlled from the homeowners phone or tablet. This project by Southern Exposure was the winner of ClaroLux’s 2013 Lighting & Design Award. It is definitely a must see! Why Buy Made In USA? Are Industry Associations Worth It?